U.S. President Donald Trump’s administration is delaying $195 million and ultimately denying an additional $95.7 million in aid to American ally Egypt over a “lack of progress in key areas, including human rights” and democratic “governance,” the U.S. State Department and White House have confirmed to Breitbart News. Meanwhile, the administration has only decided to withhold $50 million in outstanding fiscal year 2016 military reimbursements from Pakistan, which the American president himself has recently accused of “harboring terrorists” who are fighting and killing American troops in neighboring Afghanistan. The Trump administration halted $50 million in military aid for Pakistan because Islamabad has failed to take adequate action against the Taliban and its ally the Haqqani Network, considered to be the top threat against U.S. troops in Afghanistan. At the end of his administration, former President Barack Obama required Pakistan to forfeit a much larger amount ($300 million) than Trump has for the same reason: Islamabad’s support for Islamic terrorists. “The $195 million will be in an account that can be accessed at any time; but these funds will be held in reserve until we see progress from Egypt on key priorities. We remain concerned about Egypt’s lack of progress in key areas, including human rights and the new NGO law,” added a State spokesperson, also on condition of anonymity. In May, Egyptian President Abdel Fattah al-Sisi allowed the implementation of the controversial NGO law, which human rights groups and activists have denounced, saying it prohibits their work and makes it harder for charities to function in the country. Citing anonymous sources familiar with the matter, Reuters first reported that the Trump administration is withholding up to $290 million from close U.S. partner Egypt. Secretary of State Rex Tillerson “has decided that it is in the interest of the United States to exercise a national security waiver to obligate the remaining $195 million in Fiscal Year 2016 Foreign Military Financing (FMF) for Egypt, for the purpose of assisting Egypt in addressing threats to its security and strengthening the global fight against terrorism,” explained a State spokesperson, speaking on condition of anonymity. U.S. law mandates that the administration withholds 15 percent ($195 million) of the $1.3 billion it provides Egypt annually in FMF funds unless Cairo can certify that the African nation is making progress on advancing human rights and democracy. Nevertheless, the law grants the secretary of state the ability to issue a national security waiver to allow the appropriation of the funds. This year, the U.S. again decided it could not certify that Egypt had made progress on human rights. Although Secretary Tillerson issued the national security waiver, the Trump administration has decided to withhold the $195 million. 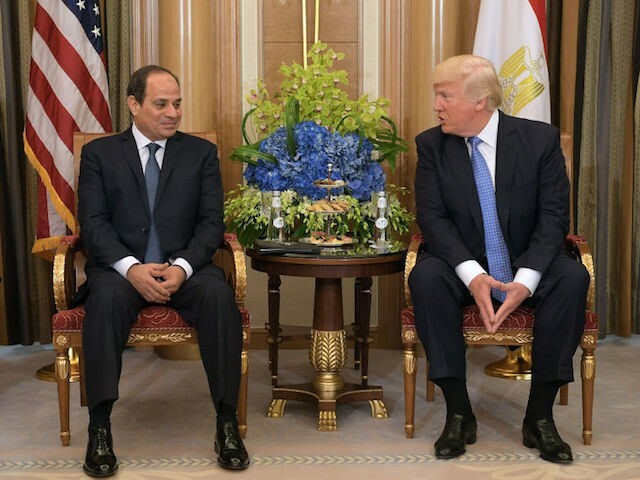 Trump administration officials insist that withholding money from Cairo will not have an impact on U.S.-Egyptian efforts to combat Islamic terrorism. A summit of Muslim leaders hosted by the Saudi monarchy this year prompted the formation of a new military alliance expected to coordinate counterterrorism operations with the United States. President Trump, who spoke at the summit, appeared to welcome the coalition, expected to include Saudi Arabia, Egypt, Jordan and the United Arab Emirates (UAE). Overall, the U.S. provides more foreign aid to Egypt than Pakistan. While the United States has funded Egypt to the tune of $2.6 billion annually in recent years, Pakistan has received about $2.1 billion each year. The U.S. provided about $30 billion to Pakistan in the first 14 years of the ongoing Afghanistan war, according to the National Defense Authorization Act for fiscal year 2015. President Trump’s 2018 request for U.S. security aid to Pakistan did drop by $186 million, when compared to the previous year. The president has advocated increasing pressure on Pakistan over its support for Islamic terrorist groups fighting and killing Americans in Afghanistan.